Could Democrats and Trump actually work together on health care? Could Democrats and Trump Work Together on Health Care? 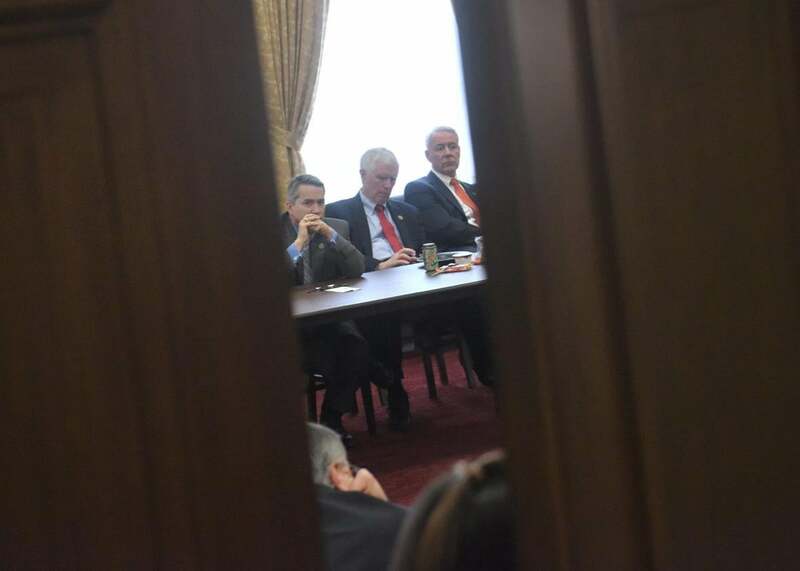 Members of the House Freedom Caucus seen in a meeting after coming back from the White House on Thursday. If Trump were the cold-hearted vengeful type (completely hypothetically, of course), the president could work with Health and Human Services Secretary Tom Price to sabotage Obamacare in the hopes of nudging it over the edge. With the status quo shattered, Democrats might then be willing to help Republicans pick up the pieces for the sake of their constituents. But it’s inconceivable that they’d simply cede to Trump and House Speaker Paul Ryan’s demands given the party’s fundamentally different policy goals when it comes to health care. More likely, they would try to lay the blame for any successful Obamacare sabotage at the feet of the saboteurs—not necessarily that hard of a sell considering the GOP is currently in power and would be the ones holding the bag. So “forcing” Democrats to the table does not seem like a likely outcome. One way or the other, then, the president and GOP leaders would need to offer Democrats a few “socialism”-flavored carrots instead of simply threatening them with “death to Obamacare” sticks. Following Friday’s ACHA collapse, some Washington insiders have been willing to suspend disbelief and suggest that might actually happen. “With #ACHA dead,” Jay Carney, Obama’s former spokesman, tweeted Friday, “both parties can now come together around market-based healthcare reform that greatly expands coverage [and] reduces costs.” Similarly, the current White House press secretary suggested Monday that Trump was more open to Democratic input than his Friday’s comments suggested, saying the president was “absolutely” willing to work with Democrats and that a number had already reached out with ideas. “We’ll look to see where we’ll get the votes,” Sean Spicer told reporters. The White House better prepare itself for a long search. Remember: The ACHA would have ended insurance for an estimated 24 million people, and yet some GOP lawmakers—and many conservative pundits—felt it didn’t go far enough. The House Freedom Caucus saw the ACHA as Obamacare Lite, so just imagine how they’d react to a version that included input from actual liberals instead of simply “moderate” Republicans. Support from more centrist Republicans, meanwhile, was hardly assured for the GOP-authored bill. Defections would likely come fast and furious as soon as the legislation includes the type of compromises needed to win over Democrats. After all, the idea that Democratic policies are doing more harm than good to the nation’s health care system was more or less a plank in the GOP party platform for the past seven years. In order to even bring a compromise bill to the House floor, then, Ryan would possibly need to break the Hastert Rule, which is the GOP governing procedure that normally prevents a speaker from holding a vote on a bill without the support of a majority of his caucus. Given the political wounds he suffered during the ACHA debate, it’s unclear if Ryan could survive the damage breaking the rule would inflict to him and his Speakership. More importantly, it’s even less clear why he’d even be willing to help pass a bill that is more popular among the opposing party than with his own. If we take Spicer at his word, then any new proposal offered by the president will be premised on repeal of the main functions of Obamacare. It’s hard to see how a) that is a compromise or b) why it would work this time around when it didn’t the last time. Spicer attempted to elide this later in the press conference when he was asked about Democratic opposition to repeal in the context of compromise and said: “That doesn’t mean we need the entire Democratic Caucus. That means we need some responsible Democrats who want to sit down and have a discussion about how to do that.” Under Spicer’s apparent definition, “responsible Democrats” are ones that would support repeal, e.g., unicorns. There’s also plenty of time left on the clock for Trump. It took Democrats more than a year to put the Affordable Care Act on Obama’s desk for him to sign it into law. It’s also plausible that at some point down the road Obamacare’s existing problems could worsen enough to where Democrats from the states hit hardest could feel enough pressure from home to consider an alternative. For now, though, Trump’s promise of the potential for a bipartisan deal would seem to be missing a key ingredient: bipartisanship.